We just had our first thundering look at Batman v. Superman, and it really did give the feeling of a confrontation between demigods. 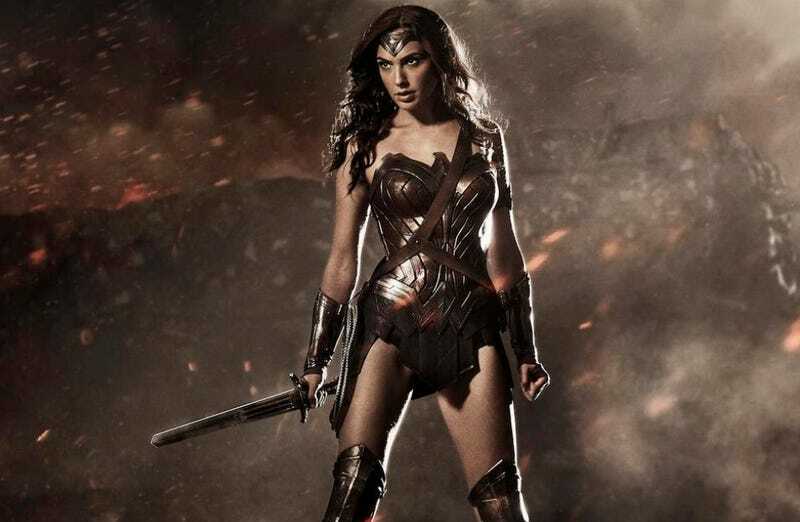 Plus we saw our first look at Wonder Woman's costume! And we saw the Trinity, Batman, Superman and Wonder Woman, on stage together. So the Warner Bros. panel started with some insane glimpses of concept art. The rooftops of Gotham City, Superman flying through flames, with an intense expression on his face, Batman standing in the rain on the dark rooftops, Batman with his batmobile, Superman running away from an alien spaceship, Superman carrying what looks like an injured Lois Lane, and Superman doing a three-point landing. Batman and Superman both looking hella intense and angry and kind of Frank Miller-esque. Ben Affleck, Henry Cavill and Gal Gadot came out on stage and posed for pictures — and we saw an image of Wonder Woman's very Greek armor-looking costume!